The Social Justice Book Club is a bi-monthly online reading group that reads books focused on social justice issues. 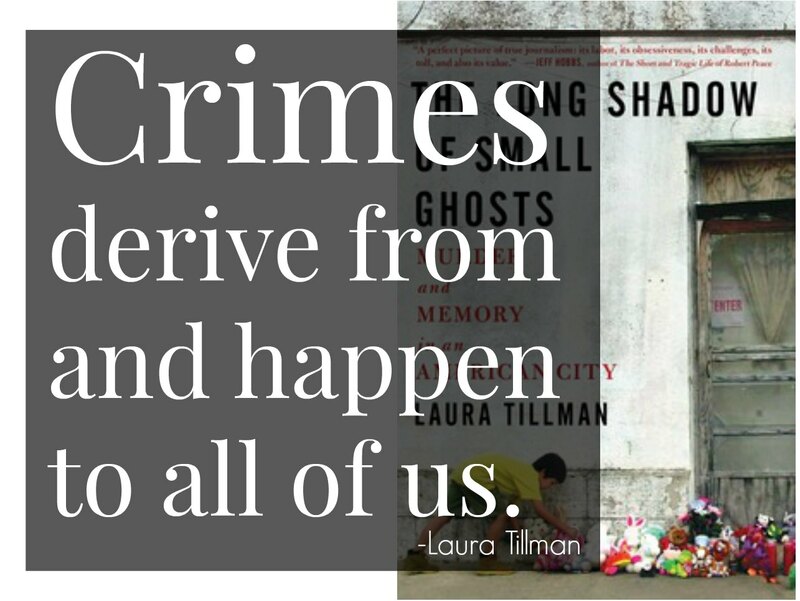 For the month of June, we selected The Long Shadow of Small Ghosts: Murder and Memory in an American City, by journalist Laura Tillman. Below, Tillman talks about the book, what it was like to write it, and recommends some other social justice books. Thanks to all who contributed questions this round! In the introduction, you write about the fact that because the victims of this crime were children, and because an explanation was never reached, those impacted found themselves questioning everything they knew about their community. Do you think that is the case with all crimes against children? All crimes that cannot be, somehow, rationally explained? That's a good question, and one that's hard for me to answer. I would imagine there is some element of disillusionment and confusion whenever a crime against children occurs - it's hard to wrap your mind around how someone could victimize a child, who is innocent and totally vulnerable. I do think that there is a difference, however, in the way a community reckons with distinct events. In the case of Brownsville, many crimes had happened, many involving children. And yet, not all left the same impression as this one. I think the building is partly responsible for the way people continued to mull this crime over, and, in so doing, how it squared with their perceptions of justice and morality. In writing about such a difficult subject, was it hard not to apply your own value judgements and perceptions onto what you learned and write about here? As a journalist, I had some practice with this - you have to hold your material at arm's length, and try to check your own emotions and prejudices as you report a story, interview a subject, and finally put it into your own words. I did include some of my own perceptions in the text, which was a departure for me. The story became about the role of the bystander in tragedy, and that evolution occurred when I realized I'd become a member of the community rather than simply an observer. How did writing a full-length book prove different from writing journalistic pieces? Were you surprised in any way by the writing process, either because it was the same or because it was different from your previous work? This was incredibly different from anything I'd done before. When I'm writing an article, and I don't have a ton of space, I need to deliver a clean thesis and structured piece to an editor. I need to keep it within the tone of the newspaper or magazine, and tease the thesis from the start. It was freeing for me to work on something without those constraints, to find my voice and tone and structure absent a prescribed style. The project was a kind of experiment in that way. It meant that I had days, weeks, months when I felt lost and there was no one and no document that could guide me. What I hope is that readers will be drawn forward by my genuine curiosity, something I don't believe can be faked. I've gotten feedback from people that they devour the book very quickly, so it seems like this strategy was more effective than I'd even hoped. This is a very difficult subject to read; I can't imagine what it felt like to write about it. How did you cope with the heaviness of your subject? I do feel myself pushing away from material that I know should interest me given my interest in this subject, but I feel emotionally spent on this subject matter. For example, I've heard that the Netflix series How to Make a Murderer is wonderful, and in a lot of ways it's related to this project. But I'd rather watch something funny when I have free time. I know a lot of people, whether they're pro-bono attorneys or other reporters, who react the same way. That doesn't mean I'm not working on other stories that are similarly difficult, but when I'm off the clock that's not where I tend to turn my focus. I want to laugh or cook or be outside. If you could wish readers would finish this book with just one takeaway, what would that be? 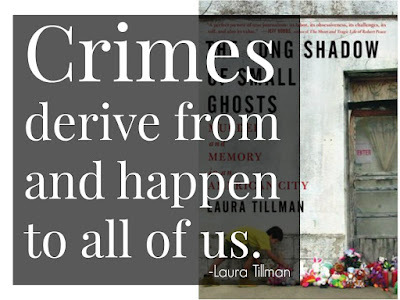 Crimes derive from and happen to all of us. I appreciate your theory that as a society we shouldn't label certain crimes and people as "unthinkable" or call them monsters and that instead we should closely examine the circumstances to try to prevent these happening in the future. I'd be curious to hear how you think we could apply that theory to acts of terrorism like 9/11 or this weekend's Orlando mass shooting. Have you tried to apply your theory to these situations? Or are these special cases that require another way of thinking? I've thought a lot about the sites of such tragedies and how we choose to remember them. I visited the 9/11 memorial recently, and stared into the void where water seemingly cascades infinitely into the earth, a hole that can never be filled. In Orlando, the Pulse nightclub will re-open, and in Newtown, the home where Adam Lanza lived with his mother was demolished, as was the Sandy Hook Elementary School. I think Brownsville's extended discussion about what to do with a site of crime, also causes us to question how these crimes fit into our understanding of our world in a very physical, tangible way. These sites ground them in reality, and also force us to question whether the conditions that created them still exist. These reflections take a long time. The initial rage has to subside, at least somewhat. I do believe that harnessing the power of time and landscape to battle more deeply with the root causes of such events applies across the board. What other books on various social justice topics would you recommend to readers of your book? Or members of the Social Justice Book Club in general? The Short and Tragic Life of Robert Peace by Jeff Hobbs is a terrific social justice read, as is Men We Reaped by Jesmyn Ward. I also loved the recent fiction debuts of Kaitlyn Greenidge, We Love You Charlie Freeman, and Preparation for the Next Life, by Atticus Lish.